Although you can't make your garage door last forever, you can, with the proper maintenance routine, make it last for a very long time. By ensuring that the mechanism is regularly serviced and all of its yet-to-fully-develop issues are nipped in the bud, you'll be able to avoid a great deal of problems, which will save you both money and time in the long run. Because garage door springs are under constant stress, you should do everything you can to take some of the strain off them. For example, having our technicians test the door's balance and adjust the tension of the springs accordingly is a great way to keep these components from overstraining needlessly. There are some maintenance efforts you can probably handle yourself, but this certainly isn't one of them, as spring adjustment can be very dangerous and should only be handled by pros. In order to see to it that your garage door opener is capable of telling when there's an obstacle in the door's way, its photo eye sensors need to be fully functional. As part of our maintenance service, our technicians will test the alignment of these units and reposition them as necessary. If we find that their lenses have become damaged somehow or that their internal components are malfunctioning, we'll replace them with new sensors. We will also test the opener's auto-reverse function, and adjust its settings if we discover that the door doesn't open back up when it encounters resistance while closing. Lubrication maintenance really doesn't get the props it deserves. By having all of the moving metal parts of your garage door lubricated from time to time, the entire mechanism will benefit. Less friction means less wear and tear, which in turn means fewer breakdowns and increased longevity. Our technicians will lubricate your door during every maintenance visit, and you'll very quickly start to enjoy the noise reduction benefit this type of service also offers. We're sure you don't want to have to carry out the required maintenance yourself, nor do you have the time, which is why you should just let our experts take care of it. This will also save you the hassle of dealing with all sorts of unexpected malfunctions that can be easily prevented with regular servicing. 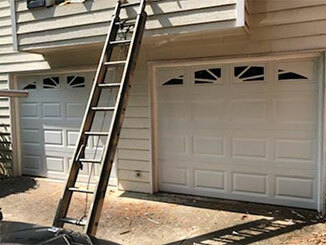 Contact our team at Garage Door Repair Greenwich today to schedule an appointment.